Steward of Savings : FREE Cappuccinos, Hot Coffee, Hot Tea, Iced Coffee, or Hot Chocolate at Sheetz! 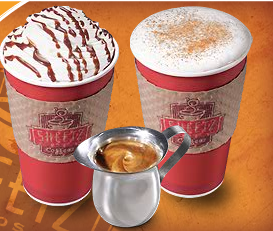 FREE Cappuccinos, Hot Coffee, Hot Tea, Iced Coffee, or Hot Chocolate at Sheetz! Go here for details>> FREE Cappuccinos, Hot Coffee, Hot Tea, Iced Coffee, or Hot Chocolate at Sheetz!